The above references give plenty of information and background on Lone Scouting. 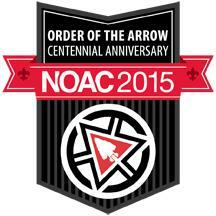 The Order of the Arrow (OA) will become 100 years old in 2015. It was founded in 1915 at Treasure Island Scout Camp within the Philadephia Area Council. The Order of the Arrow's official webpage which explains the activities during 2015, including the National Order of the Arrow Conference, is at this location. Some estimated 3,000 or more pieces of insignia will be produced by various OA lodges, the four Regions, the National Council of Chiefs, and many local Councils supporting the Order of the Arrow's Centennial. A site displaying much of the Order of the Arrow's insignia is located at at this location. It is managed and maintained by John Pannell. The National Executive Board of the BSA received approval to a one-time exception to the placement of the below insignia. Member nations of the World Organization of Scouting Movements (WOSM) had agreed that only that nation's National, international encampment and World Jamboree insignia would be worn above the right pocket by member nations. The BSA petitioned that its Order of the Arrow (OA) program has been so instrmental in the organization, development and sustainment of hundreds of camps in the United States and around the world, that recognition by those in attendance during this once in a decade program should be recognized. The WOSM approved the request in the fall of 2013, and the below insignia may be worn by Arrowmen participating in the 2015 National Order of the Arrow Conference (NOAC) in the space above the "Boy Scouts of America", "Venturing BSA", or "Sea Scouts - BSA" strip (and above any interpreter strips received) on a PERMANENT basis by that wearer. There is a large NOAC backpatch which will be available -- a larger version of the uniform patch shown above. This is worn either centered on the backside of a red jacket or a red jac-shirt ("jacket-shirt"). He can choose to wear this or one of several OA jacket patches -- but for best uniforming, he should wear ONLY ONE on the back of the jac-shirt or jacket. Check out the jac-shirt link to see how that emblem would be worn on the back of the jac-shirt or jacket. As with the 50th and the 60th Anniversaries of the Order of the Arrow, a special cloth emblem may be worn by youth and adult Arrowmen meeting the requirements. This emblem is worn above the tip of the Arrow for Ordeal members; or above the top bar on Brotherhood and Vigil Honor sashes. It is NOT worn with the special black and white sashes which will be provided to NOAC participants. If an Arrowman has earned either or both 50th/60th Anniversary emblems, those emblems are worn BELOW the bottom bar on the Brotherhood or Vigil Honor sashes. 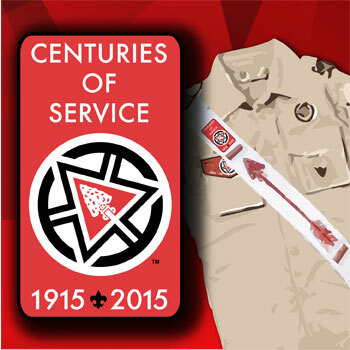 Have a great time at the Centennial NOAC -- it promises to be a great program! !